A member of the Dipsacaceae family, the nearly flat gray-green basal foliage of the pincushion flower hugs the ground. 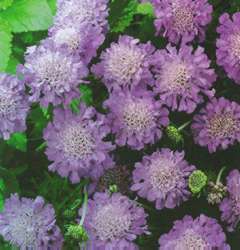 Lacy lavender-blue, two-inch flowers bloom on slender 12- to 15-inch stems from late spring through early fall. Flowering begins in mid-spring with repeated flowering throughout the growing season when consistently deadheaded. In some climates 'Butterfly Blue' flowers until late December. Pincushion flower derives its common name from the stamens which stand above the petals resembling pins stuck in a pincushion. The leaves are hairy, ovate to lance-shaped, with the upper foliage smaller and finely divided creating a mounded rosette six to eight inches high and 12 to 15 inches wide. Rudbeckia fulgida 'Goldstrum'- H/W 18-24" x 24"
An outstanding perennial, familiar to gardeners for decades. It is very easy to grow . No matter how dry the summer or extreme the winter Goldstrum is noted for its consistancy and dependability. 'Goldstrum' is a compact plant which forms an increasingly larger clump that is not invasive, but it certainly is determined. Very upright plant covered with mid-sized, traditional black-eyed golden daisy blooms. It will do well in any reasonably good garden soil. 'Goldstrum' is a great companion perennial with plants of similar height such as Sedum 'Autumn Joy', Liatris spicata 'Kobold' -- or taller ornamental grasses -- or mass planting. 'Goldstum' retains its shape and distinctive black cone throughout the fall and winter thereby providing excellent ornamentation. 'Goldstrum' is an excellent cut flower -- fresh or dried -- also an excellent for attracting butterflies. Echinacea purpurea - H/W 24"- 36" x 24"
HARDINESS Zones 3-8 LIGHT Full sun preferred. SOIL Well-drained garden soil. Drought-tolerant. USES As a specimen, in borders, or massed. Good choice for meadow or prairie gardens. UNIQUE QUALITIES A bold, mid-summer blooming perennial with carmine, non-drooping flowers. Blooms on 2- to 4-foot sturdy stems. Excellent for cutting. PLANTING INFORMATION Water well until plants are established. Plant at the same depth as they were in the pots. PROPAGATION 'Magnus' may be propagated by seeds, basal cuttings, root cuttings, or division. Seed propagation is the main method of reproduction. Habitat: Well-drained soils with a PH of 6.5 - 7.0, sun. Cultivation:Add lime if your soil is too acidic. Culinary: Rosemary has a pungent, somewhat piny, mintlike flavor. Medicinal: The blue flowers and leaves of rosemary contain a volatile oil containing antibacterial effects used as an ingredient in liniments. A dense evergreen, aromatic shrub with resinous, needlelike leaves. It has soft, blue, pollen-rich flowers that bloom in the spring and are loved by bees. 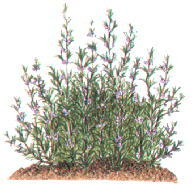 Most rosemary will begin to bloom in the fall and continue through the winter, if kept cool. Rosemary originated in the hills of the Mediterranean, Portugal, and northwestern Spain. Lavender is the Herb of the Year in 1999. Preferred Exposure: Full sun, but does not like hot weather. Special Conditions: Buy plants rather than seeds; often not true from seed and slow to germinate. Harvest spent blooms regularly even if you don't use them, for longer show. Plant 2-3' apart for good air circulation; prone to fungal problems. Recommend light mulch of sand which reflects heat up and into center of herb. Prune in spring; fall "hacking" can cause winter kill. Mentha, commonly known as Mints. Mints vary in size from the very tiny, bright green Corsican Mint (Mentha requienii), through the tall, fuzzy, gray-leafed Apple Mint (Mentha suaveolens). There are variegated mints, such as Pineapple or Variegated Peppermint. Some mints are smooth-leafed, others are woolly-leafed. Leaf color may vary from deep green, through reddish-purple tomes, to the haunting Silver Mint, which is a lovely addition to Moonlight Gardens, and a favorite for design work, with long wands of white blooms. Always valued in kitchens across the world, the number of recipes including mint is inexhaustible. Flavors have an even wider range, covering lemon, orange, lime, peppermint, spearmint, pineapple, wintergreen, chocolate, and more. There are mints that are especially good for teas, such as Blue Balsam Tea Mint & Lebanese Spearmint. In addition to cooking and teas, mints have long been used in beauty and health preparations, mouth washes, toothpaste, after shaves & cough syrups. Powerfully scented peppermint leaves have been used to deter mice from entering cupboards and closets. Pennyroyal (Mentha pulegium) is a common flea repellent. The Herb Society of America, dedicated to promoting the knowledge, use and delight of herbs through educational programs, research, and sharing the experience of its members with the community.Membership is open to anyone interested in herbs. Membership may be as an individual or through a unit. Units of The Herb Society of America are autonomous groups and may have separate membership requirements. The National Headquarters is located in Kirtland, Ohio (near Cleveland) adjacent to the Holden Arboretum. The house was built in 1841 using local stone by a Lake County farmer, Henry Earl, and is now considered the oldest stone structure in Lake County. It is on the National Registry of Historical Places. The building is open Monday through Friday 9:00 A.M. to 5:00 P.M..
our site will keep in pace. Please, come back and visit often. Hopefully, you�ll like what you see. Blossom Farm: Grower of common to exotic Perennials & Herbs and introducing Hand-crafted Herbal Soaps & Gifts.We specialize in raising winter hardy perennials and herbs that are fragrant, colorful and nectar rich that butterflies and hummingbirds adore. This year we have over 350 winter hardy varieties grown on the premises in a un-heated poly house. Strong perennials that have withstood an Ohio winter. Perennial gardens at a home in Carpenter, North Carolina USA (zone 7b). Throughout these pages you will find lots of different photos from my gardens from the past couple of years, and ramblings about the plants and the gardens in general. Pinnacle Plants: Our perennial list of rare and noteworthy plants are now available for ordering to be delivered this Spring.These perennials represent some of the latest advances in the Horticultural kingdom and we are proud to be bringing them to your attention. Peruse our Flower Beds at your leisure and make your selections. Welcome to Wolf River Valley Farms! From Ajuga to Yarrow, we've selected over 150 varieties of beautiful and unusual perennials that have proven their worth in our gardens. Our herb selection has over 40 varieties, including six Basils and several Thymes. We have many hard-to-find annuals that can provide season long color and contrast in your perennial and herb gardens. Gardens Amazon Gift Picks! Click cover to order! by title, author or key word using the box below.